I want to share a great store experience I had in Bedford, Texas! 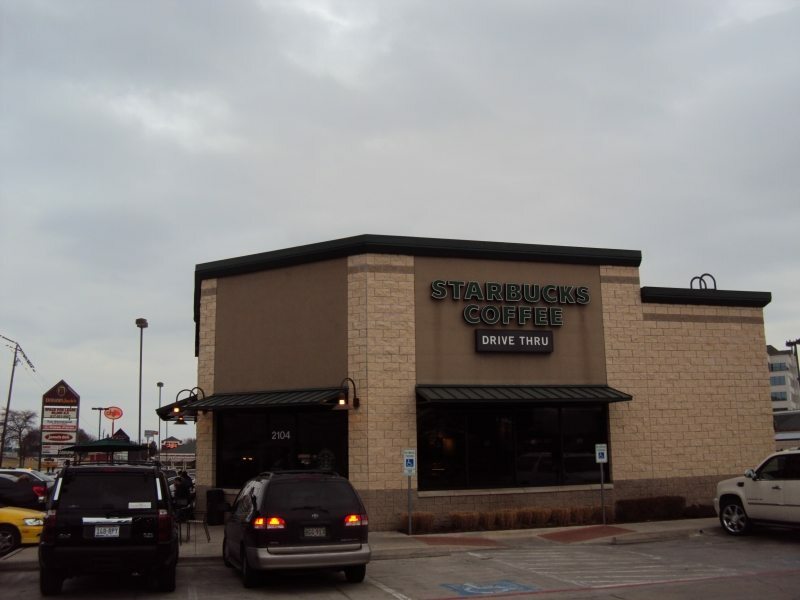 I was visiting Texas to meet up with a group of partners from all over that big state, and one of the group suggested that one of the best Starbucks he knew of was in Bedford, Texas. I would note that none of my Texas friends actually work at that Starbucks, nor did that store know that we were coming by for a visit. We drove for about thirty minutes, and ended up in this place called Bedford. There, we found a Starbucks right off of the freeway. I went inside and ordered Gold Coast Blend. The register partner offered to make me a pour over, so of course I said “yes” to that. This store is both a cafe and drive-thru location. The cafe generally stayed a little bit slow, to moderately busy while we visited the store. Our group plopped down with beverages, pulling two tables together, and chatting away. I would note, it looked to me like the drive-thru stayed crazy busy. Clearly partners were hustling to make orders, and as best as I could tell, the drive-thru really was driving a lot of business at this location. I really enjoyed the classic 1990s era interior design of this store. One thing that is missing from the newer “repurposed”-designed Starbucks stores is the posters of the coffee stamps. 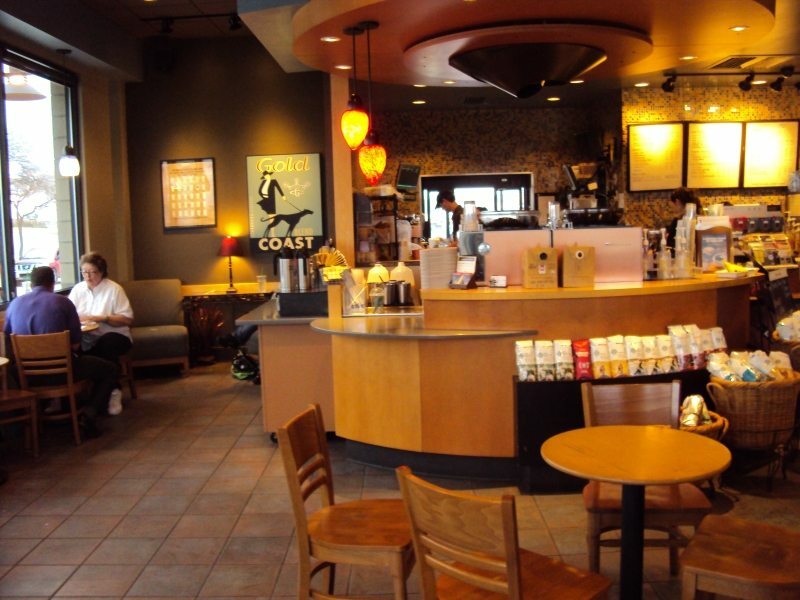 This store had a large Gold Coast Blend coffee picture over a comfy chair seating area. Someday I would love to have some of those old posters to decorate my home! 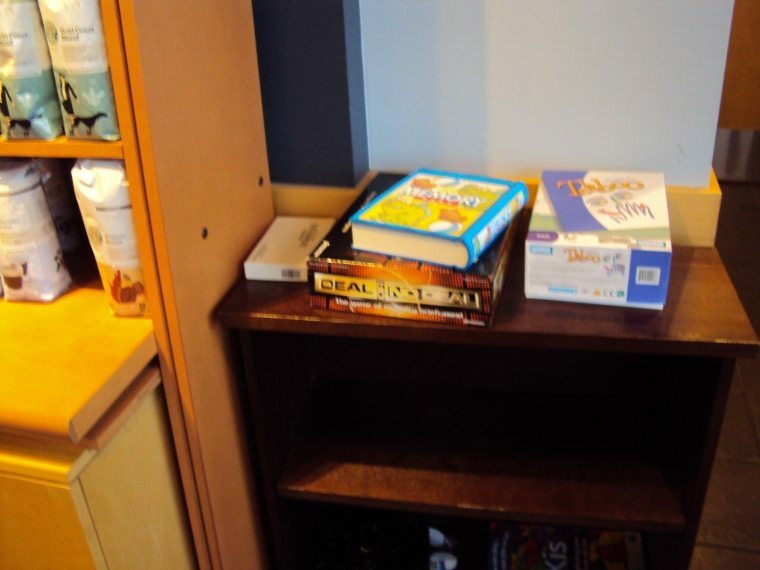 I noticed that this store kept a supply of games handy for the cafe customers. I even saw a small group of people playing them, but I didn’t take a picture of them. While our group sat chatting, a barista carrying a tray came up to us and said that he was sampling Komodo Dragon paired with the reduced fat cinnamon swirl coffee cake. I was very impressed by the active sampling. I asked the partner, “did you come sample just because of me?” (I know that sounds silly but I was wondering if he knew – somehow – that I was writing a blog post on his store, even though that seemed very unlikely.) He replied, with a bit of a chuckle at the silly question, “No. 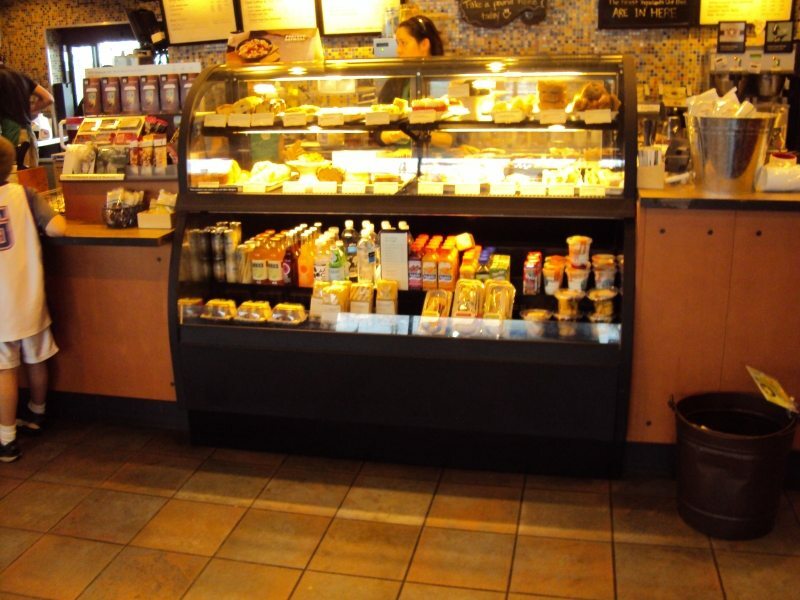 We schedule some sampling into every shift.” I was impressed that even though the drive-thru seemed to be driving the business for the store, the cafe was never overlooked. By the way, I didn’t hear my Gold Coast Blend being called out from the bar (likely because I was pre-occupied with the conversation with my three friends) and so by the time I got up to the beverage pick up area, the drink had been sitting a while. The barista at the bar (who I think introduced herself as “Alex”) was concerned that my coffee had been sitting for so long. She offered to re-make it, if it had cooled off too much. I took a sip, thanked her for the offer, and told her it was just fine. (And indeed it was. I feel no need to burn my tongue with my beverages.) There is no way I would have asked her to remake a pour over, but I thought that was a touch of an elevated customer service experience. By the way, if you happen to be in Bedford, Texas, looking for this store and can’t find it, it is possible this store might totally disappear. 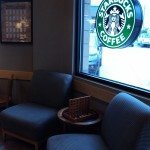 One person in my group said that he heard that the building this Starbucks is in, is slated to be demolished. Apparently Texas wants to widen the freeway that this store sits right adjacent to. This means the building would be demolished for expansion of the freeway, and hopefully, the store will be rebuilt next to the improved freeway. Hope you enjoyed the store review! 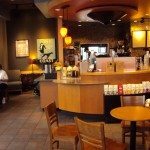 Goodbye Puget Sound Plaza Starbucks (Starbucks store #103). Seattle’s Belltown neighborhood gets a brand new Starbucks. Roy Street Coffee inspired by Starbucks: Meet the neighborhood! Really awesome story of a great store. Melody truly a Texas experience! I think it is so neat to have periodic sampling during each shift. What great customer service! 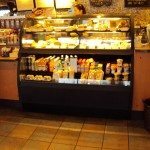 It seems like the cafe part of this store is a big area like the cafe part of the store where there is a drive through here so going around with samples would really work. I also like the idea of games being placed out for customers to use. Great review. Love the picture showing those massive whole bean coffee bags. Here in Europe it’s 250g bags only for €6/$8. Noticed the sample cups were Christmas branded too! Am I naive in thinking until now that active sampling really was a standard that all cafes followed? 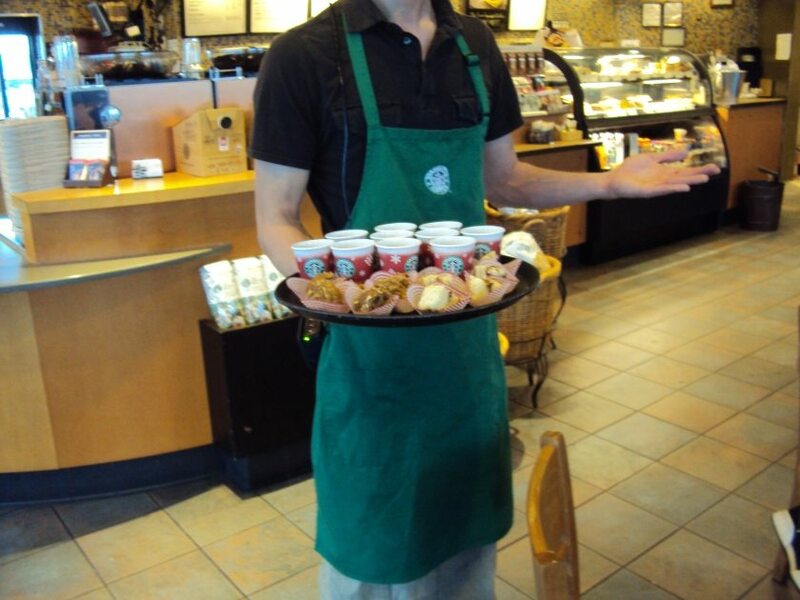 I thought everything was BIG in Texas so how come those samples weren’t served in Trenta size? Thanks for the tour Melody I really enjoyed your thoughtfulness. By the way my top business card supplier is in Brownwood, Texas. Thanks for visiting my store! I’m so happy I got meet you and I hope to see you next time your in Texas. Enjoyed reading your review! They sound quite friendly down there! I wanted to join in the summit if possible. I like designs of the store. Thank you for rare pics, if the store moved, Melody took precious photos. “Trenta size samples”. Nice! Haha. However, the samples are Japanese normal size. If you want to watch Japanese sample size, a microscope is necessary. I miss the slower pace of some of the stores. 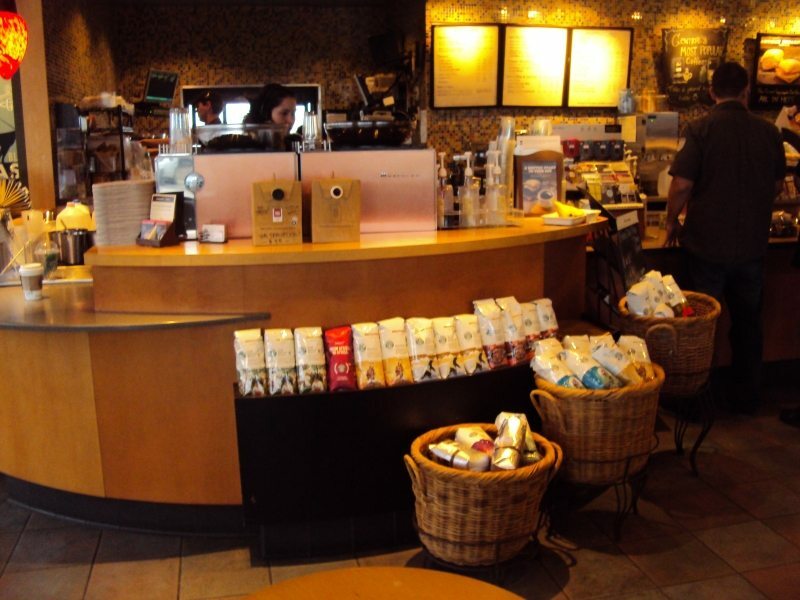 I know the idea is to be busy and have lots of revenue and business WITH great customer service but the last few times the starbucks have been both small and really crowded. I say this with LOVE because the lines did move pretty fast but there’s that part of me that likes the idea of a roomy sit n stay (and I’m also biased because I’m a bit claustrophobic lol) Your trip and visit there sounded perfect! Welcome back. Interesting visit. I find it AMAZING that this store does tastings or samplings EVERY SHIFT??? that’s amazing. Everything re: sampling has become minimal around here. minimal Nothing like it used to be. Personally, I think they’re often too busy rearranging or tryng to sell VIA. I rarely ever ever (unless I must) go to a drive thru store..and I always go inside. The one upside of their attention and busy-ness with the drive-thur is that often they do have comfy-nearly-empty spots inside….good for us. I am so glad you had a good visit, that’ a long plane ride! Wow! Sounds like a great store! I have been making cute little skinny caramel macchiato samples lately. I just started coffee master, so I will be hosting 3-5 coffee tastings each week. I will also try to include some tea tastings since the new full leaf teas deserve some recognition too! Hello everyone! I am really sorry that I haven’t been more active on my own site! Eeek! I am sitting at the DFW airport at this very moment, waiting, waiting, waiting, working on my blog because I got here a little too early. There are more store reviews coming, though this one here (Bedford) is one of the very best stores I saw. This store is just nailing it. The annual meeting of shareholders is just one month away (or very close to that), so I had been wanting to get up the next blog post of the next annual report in sequence. I’ll have all the Austin Starbucks store reviews up over the next ten days or so, but I thought it would be nice to have a brief break with the 1994 Shareholder report. Noboru and SuzanneC – Your sample size comments crack me up! And by the way, everything is bigger in Texas! It is true! samples ARE supposed to be done EVERY shift. 200 samples a day is what is supposed to be happening. It’s hard sometimes, so you take advantage of when you can do it. I love doing coffee samples with a pairing, but many time’s people are put off that it’s not a sickly sweet drink. oh well! A good sampling is a true work of art. I do not always expect a tasting to be ready whenever I walk into a store, but I am extremely pleased if there is one. I love to have coffee samples out of ceramic tasting cups! 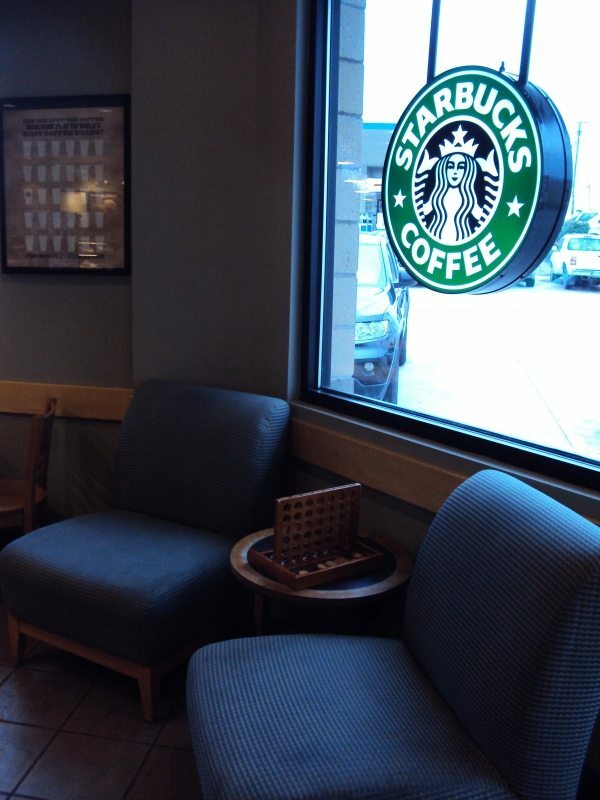 There’s really something special when the ‘Starbucks Experience’ is executed, isn’t there! Thanks for sharing such a great experience, Melody. I only wish I were there! So glad to have gotten the chance to spend some time with you, @CamSpi and to meet Taylor on your visit to the state. 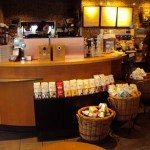 Stores can be a hit or miss sometimes as far as the amount of coffee passion that is still present in as we all try to use what time is earned for sampling and tastings. It was nice to see that stores with higher revenue such as a drive thru can accomplish that building into the schedule. Can’t wait to read of your other store visits although the one in downtown Austin was a special store indeed and not just because of the staff. Happy you got you first Trenta™ in Texas because you know it’s always bigger here. Just keep in mind that a couple of other Starbucks that you find special are only 30 minutes away from this location but then everything is at least a half hour drive. LOL We like a lot of breathing room in the South. I’ll get your shirt in the mail in the next couple of days. Cheers. You keep saying that the store is in Bedford (which it is) but your address says Dallas?!?!? BTW – The rumor is that this store is one of the highest grossing in the area. Hopefully they will rebuild before the freeway expansion. Hooray! 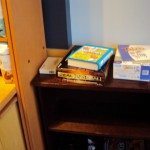 Mike, Welcome to the blog!! Please “like” the blog’s facebook page. Good catch! That is totally my mistake. I appreciate you catching it! I should have caught the city mistake before and I’m surprised it wasn’t mentioned sooner. I know why the mistake. 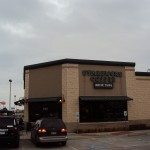 When I started writing this blog article, it was much longer and included a review of the Clover Starbucks in Dallas, on Knox Street. I cut down the blog article, and a separate article on the Dallas Clover store never got written. The mistakes are definitely from when I started the blog with one idea of covering two stores, but then later made drastic edits.